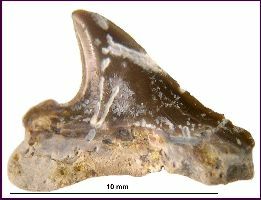 INVERTEBRATE FEEDING TRACES ON FOSSIL SHARK TEETH? The photographs below show what appear to be invertebrate (gastropod?) 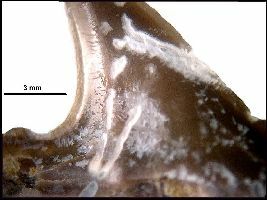 feeding traces on the enamel of a small (1.3 cm) Cretoxyrhina mantelli posterior tooth from the basal Greenhorn Limestone Formation (Upper Cenomanian) of Russell County, Kansas. Similar feeding traces have been found on other shark teeth, mostly Cretoxyrhina, from the Cenomanian Greenhorn Fm. to the Lower Coniacian Smoky Hill Chalk Mbr. of the Niobrara. The traces are usually are found only on one side of the tooth and penetrate only slightly below the surface. 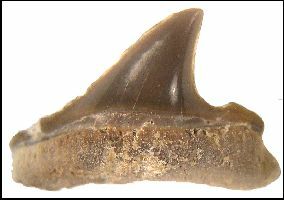 The traces observed on the teeth (not just the one shown) are the shallow, white depressions in the otherwise dark brown enamel of the tooth. Most occur in a more or less straight line (Narrow "V" shape below). The V-shaped marking is made up of two diverging 'feeding traces' that have a fairly uniform width of about 0.2 mm. The broader 'slash' that goes from upper left to lower right across the top of the crown appears to be two parallel traces. However, some are more random. Note the smaller patches of abrasions between the deeper grooves. Damage due to modern plant roots is also being considered. 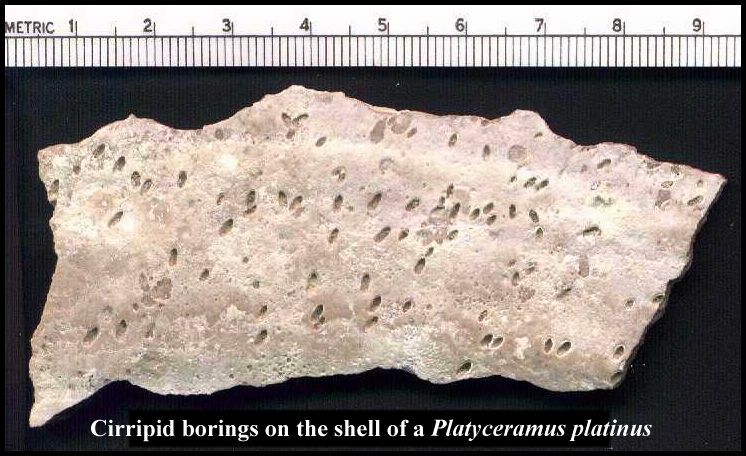 The only (very unlikely) candidate that I can think of at this point are cirripids which are known from borings on inoceramid shells... otherwise, preservation of most smaller invertebrates is poor in the basal Greenhorn Limestone and Smoky Hill Chalk. I would have to admit that I have never looked closely for anything to be associated with these isolated, shed teeth, but I suspect the damage occurred some time before the tooth was finally buried. Underwood, C. J., Mitchell, S. F., and Veltkamp, C. J. 1999. Microborings in mid Cretaceous fish teeth. Proceedings of the Yorkshire Geological Society 52, p. 269-274. This tooth (Far left: labial view; Far right: lingual view) was recovered in situ from a calcarenite limestone, and removed without mechanical aid, so tool marks are not a possibility. 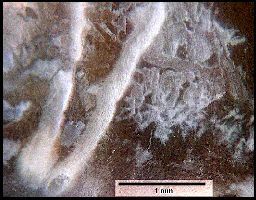 Some of the shallow grooves show faint rasp-like abrasions. Any suggestions as to the identity of the invertebrate (or other cause) would be appreciated.